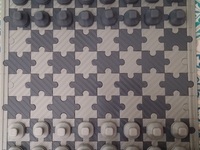 16x16 inch Chessboard by JuliaTruchsess is licensed under the Creative Commons - Attribution license. 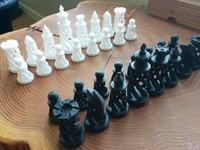 I remixed PerryT's excellent chessboard design for printing in only four sections as opposed to sixteen sections, on the 300x300mm bed of my RaiseN2 printer. I didn't mess with PerryT's "puzzle" connectors, so they are a tight fit here as they were on his original. They went together like a charm for me - very snug but no hammering required. 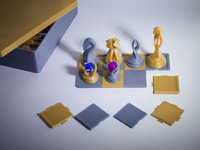 The tiles and chess pieces are printed in PolyMaker's new Polysmooth PVB filament and aerosol-polished in the "Polysher" to provide a smooth, glossy surface. I made the tiles thinner (and the frame base correspondingly thicker) than the original, and made the tile tops smooth rather than honeycombed. Printed with PolyPlus PLA. Went for 290µ for speed but 200 or less would be a bit nicer.